WASHINGTON, DC -- It’s been a busy month for the Russia and Ukraine-focused think tank analysts in Washington. This Monday is sanctions upgrade day. Vladimir Putin meets with Donald Trump during the 25th APEC Summit last year. 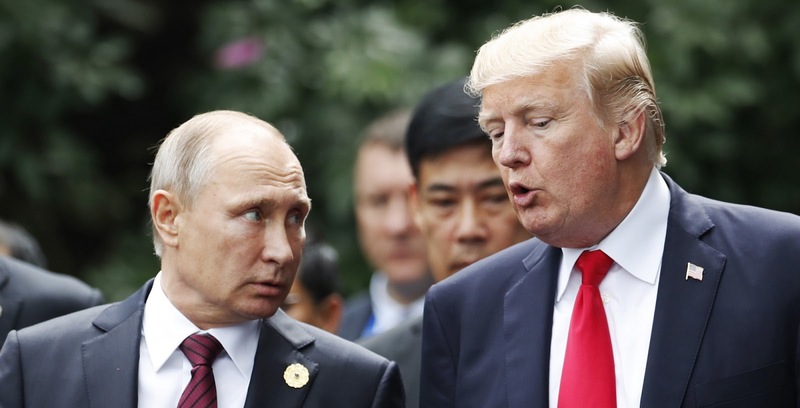 Russia experts have been providing new names for U.S. Treasury to sanction, with most of them simply going after anyone and their relatives close to Vladimir Putin. It’s been the talk of the town in some circles in both Washington and Moscow since November. Meanwhile, the market is betting Treasury won’t sanction Russian securities. Stocks are up over 12% so far this month and beating the rest of the emerging markets. “Sanctioning Russian bonds hurts American investors more than the Russians,” says Gorky Urquieta a fund manager at Neuberger Berman in Atlanta. That would be especially true if bond sanctions were retroactive. Nevertheless, as Russian sanctions get their maintenance Monday, what can be done in Ukraine’s war torn East to put an end to the imbroglio? Once the war is over, Russia becomes a real investment story again. But until that day, the overhang of the bloody conflict will continue to weigh on Russia. More importantly, until the fighting is over, it will continue to prove prohibitively costly to Ukraine, a country still reeling from its loss of Crimea to the Russians in 2014; thousands of dead; a recession; an IMF bailout; and the ongoing separatist movement in the Donbass, which is the source of sectoral sanctions on Russian energy and banks. “This division in Luhansk and Donetsk is artificial,” says Andreas Umland, Senior Research Fellow at the Institute for Euro-Atlantic Cooperation in Kiev. Donetsk and Luhansk are two of the most important areas within Donbass, the industrial heartland of Ukraine. “This is an area controlled by Moscow. It is a pseudo government. This whole narrative of a Russian Spring and popular uprising is nonsense. Of course they have tapped into local grievances. About a third of the population of those two oblasts are all for Russia and annexation. But it is only a third. In Crimea, it was half. This is basically a proxy war between Russia and Ukraine,” Umland says. Russia’s calculation was that Ukraine would collapse. It’s close. The territorial dispute scares off investors. To Russia critics, if an Eastern, Slavic, Orthodox Christian country with a different model of the future is successful, it creates problems within the power structure of the Kremlin. To Russian officials, this is all defined as a Western-backed initiative to pull Ukraine into Europe. The goal is to make it a full-fledged member of NATO, according to Ukrainian president Petro Poroshenko. But that can’t happen so long as there are territorial disputes. Putin is up for re-election in March. His popularity is over 70 percent. His closest challenger is an aging, but loud ultra-nationalist from the Liberal Democratic Party named Vladimir Volfovich Zhirinovsky. As the Russian joke goes, the party is neither Liberal nor Democratic. Neck in neck with him is Pavel Grudinin, an agribusiness millionaire who is running on the communist party ticket. Putin’s most famous challenger is Alexei Navalny, better known as an activist than as a politician. He is forbidden to run, and his Party of Progress has no seats in the Duma so even if he was allowed and won, he would have a hard time forming a coalition government. The Russian sanctions started as punishment against individuals for Crimea’s annexation in 2014. The list has been expanded twice already and counts mostly Russian businessmen and political figures, along with some Ukrainians. Ukraine remains the life blood of sanctions, and if Russians want them removed, something has got to give in Donetsk and Luhansk. The area is a mess. It pits rich businessmen against one another, alongside Kiev and the Kremlin. Those who want sanctions removed so they can access their money in the U.S., or so they can get back to business in Donbass and rebuild, blame those who are either financially or politically motivated to keep fighting. Washington blames the Russian government for supporting the separatist movement. Putin has said that Russia is indeed supporting them, but that much of the hard support in terms of financing was coming from “patriots”, some of whom are Russian citizens, or ethnic Russians in Ukraine. These so-called patriots – often ultra-nationalist Russians – are highly problematic to the success of the Minsk Accord. That accord, signed in the capital of Belarus in 2015, outlines how this all ends. The argument in Washington is that sanctions stopped funding private militias. The war didn’t stop. But it didn’t expand. “If the Russian government was not funding these men, or manipulating them into doing their bidding, the independent republics in the Donbass wouldn’t last a week,” Umland predicts. In that case, they’d go back under Kiev’s control. In the second row sit all these advisors like Konstantin Zatulin. Zatulin has been kicked out of Ukraine at least twice. He is the First Deputy Chairman of the Committee for the Commonwealth of Independent States in the Duma, the political body that handles relations with the former Soviet Republics and Russian speakers abroad. In the third row sit the “war profiteers”, adventurous, private equity millionaires like Konstantin Malofeev, part of the Putin “patriot” class that execute it all, along with anti-Western intellectuals like Alexander Dugin, and Moscow-born Alexander Borodai – the first self-proclaimed Prime Minister of Donetsk, a republic in the Donbass. Boradai has since been replaced by Alexander Zakharchenko, a local who lends credence to the Russian position that the uprising against Ukraine is grassroots driven. He was a militia commander, believed to have been funded or given orders by Borodai, a former war reporter for the RIA Novosti newswire in the 1990s. Each of these men are sanctioned by Washington as part of the Novorossiya project, an attempt to carve out eastern and southern Ukraine and reattach it to Russia. This is a project which some have likened to a return to the czarist Russia days. To many Russians, those were the days – until the Bolsheviks upended it all. Russians were kings and queens and princesses rolling around in massive Cinderella carriages bigger than their European counterparts. Communism and the fall of the USSR destroyed it all. Some want those days back. It’s practically a matter of religious pride. They say that further pressure on those sanctioned now, and new ones to come, could force Moscow to openly support the breakaway republics rather than put the pressure on characters like Malofeev. That open support might not be what Russia has in mind. It goes against Putin’s claim that the Russians fighting there are not on orders from Moscow. A common motive among those higher echelon figures fighting in Ukraine is to buy protection against criminal prosecution in Russia. This is where the offer of freedom of prosecution can be attractive. As it is now, some players are on this sort of ‘do what the Kremlin says’ parole. The suspect or the accused in criminal misdeeds buys protection by participating in the Novorossiya movement as field generals or financiers. It is also common for the new leaders of these Republics to finance themselves by smuggling coal into the European Union as if it was coming from Russia. That is illegal due to sanctions. “It is well known that Borodai, for instance, worked for Malofeev. Malofeev strongly supports the ‘patriotic’ cause and apparently believes that the state of Ukraine has no right to exist. He has been one of the wars beneficiaries,” according to Filimonov. Rostovtsev is a Russian coal tycoon who has established a business of re-exporting coal from the Donbass. According to Russian and Ukrainian press, Rostovtsev is your typical ex-Soviet Union entrepreneur; he is a former Moscow and Sochi government official turned millionaire. He has his hands in everything from construction to commodities. He was reportedly chairman of one coal industry holding company called UK Taldinskaya and beneficiary of Swiss-based Kaproben Handels, the company that is reportedly linked to coal smuggling from Donbass. He is considered one of the key backers of the Donetsk People’s Republic (DPR). According to sources in Ukraine that could not be quoted on the record, Rostovtsev helps pay for coal miner pensions and numerous social programs as the region has been cut off from Kiev. His investments in Europe – namely Cyprus and Switzerland – are used as a means to represent the DPR in Europe. Like others who are allegedly working to atone for past crimes, Rostovtsev has a number of criminal cases opened against him in Russia. It is believed that active participation in the business of DPR allows Russian businessmen to avoid legal problems in Russia, including criminal prosecution. The Organization for Security and Cooperation in Europe (OSCE) has been a non-biased observer of activity in the Donbass for the past four years. But when asked about the men some Washington think tanks believe should be on the list, they provided no comment. Many people prefer to stay quiet, making the Russia-Ukraine story a hard nut to crack. Some fight for Russia. Some fight for Ukraine. Others are working both sides. What is easy to understand is that Russia and Ukraine are no different than the West insofar as rich businessmen with political axes to grind, or a passion for history or religion, carry out the whims of the State, often on their own, and sometimes conspiring with governments. Mostly all of them made their money in finance. Others in heavy industry and the commodities. Malofeev started his career as an attorney at Renaissance Capital, he later became an investment banker for MDM Bank in Novosibirsk, Russia. In 2005, he and his partners founded Marshall Capital Partners investment fund, registered in the British Virgin Islands. Throughout his career, Malofeev was involved in several scandals related to illegal takeovers and has had his offices raided as recently as 2015. In late 2012 - early 2013, law enforcement conducted searches at Malofeev’s house in connection with a criminal investigation lodged against it by VTB Bank. They say he embezzled $225 million. The case was tried in London with no success. Malofeev and Marshall Capital were innocent. On June 17, 2014 Zurab Chavchavadze, Director General of the “Saint Basil the Great Fund”, and Alexander Borodai, reached an agreement to “organize a joint collection of humanitarian assistance in the Russian Federation” to distribute aid to residents in east Ukraine. The humanitarian battalion -- called “Novorossiya” -- was reportedly funded by Malofeev. In a rare interview with the Financial Times, Malofeev said his work in Donbass was based on his Christian Orthodox values. And that he is not funding militias, but helping those hurt by the war and subsequent economic destruction. Outside of DC, there are some Ukrainians who would like to see local Donbass media mogul Alexander Timofeev added to the list. They charge that Timofeev has become rich since the war by illegally taking over businesses through strong arm tactics, like blocking owners access to their assets. He is believed to be one of the top 20 richest separatist leaders. In 2015, his assets were estimated by Ukrainian authorities to be around $17 million. Before the war, 46-year old Timofeev founded DonSatTV company, a cable and broadband internet service provider still operating in Donetsk. He is accused by local businessmen for organizing illegal trafficking of fuel and lubricant materials from Russia into Ukraine. According to local media reports, he is known for organizing illegal trafficking schemes to transport coal from Donetsk to industrial facilities owned by Ukrainian oligarchs. He “nationalized” and controls the Kiselev coal mine in Torez City. He also allegedly took over the energy market of the region for the DPR government, and allegedly took-over private warehouses used to store tobacco, alcohol and jewelery. He has no traceable personal ties to the Russian government, but is the type of character that is benefiting from the war and has little incentive to work with Kiev on peace initiatives. In 2016, Timofeev was appointed Acting Deputy Chairman of the DPR Council of Ministers. “I couldn’t tell you how close any of these men are to Putin or if Putin even knows them,” says Filimonov.